Jonny Cola and his band of A-Grades - right-hand man Mauro Venegas and producer extraordinaire Jez Leather on guitars, bassist Simon Drowner supplying extra eyeliner, with drums given a sound thrashing by Marco Testa-Ryan - are starry-eyed pushers of edgy glam-rock pop songs to a growing number of disenfranchised refuseniks. Following several years drunkenly roaming the London musical underground, dog-eared Travelcards in hand, partners-in-crime Jonny and Mauro decided to see what would happen if they joined forces. The initial culmination of this endeavour was the slightly scattershot debut album In Debt. Despite being heavily underpromoted and purely released as a download, the album and its songwriting pricked up a few ears in certain quarters and laid the ground - albeit tentatively - for what was to come. Let’s do this properly then - enter Jez, providing not just more guitar (always a good thing) but recording expertise to boot, backed up by Simon and Marco’s harder, tighter rhythm section. First step - rescue a little of the back catalogue from obscurity with the Postcode Wars EP (“Think ‘All The Young Dudes’ with the slick rhythms of Blondie” - Artrocker), released by tiny indie Scratchy Records on 10” vinyl alongside a Warriors-referencing video directed by Jez and Jonny. Next, a Christmas anthem - ‘All I Want For Christmas Is An Action Man’ - accompanied by another self-made vid. Things were starting to warm up. The gigs were getting a lot busier, a fledgling scene threatening to develop around clubs like GlamRacket and a handful of other bands not slavishly chasing the next East London trend. 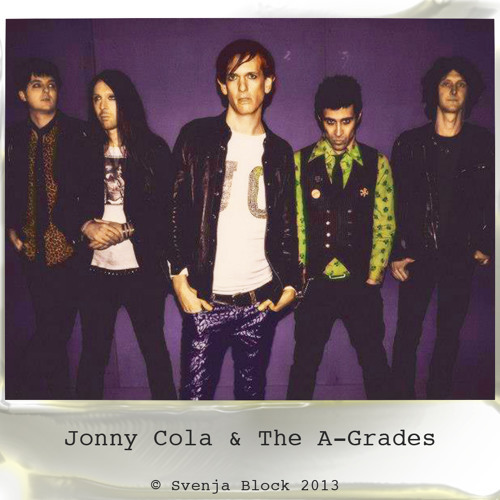 In March 2012, Jonny Cola & The A-Grades released the Halo EP. Very much the product of a more confident outfit with an increasingly clear identity, its four songs sparked particular excitement in the rock press, with Big Cheese drooling over its “glammy, anthemic punk hooks”, UberRock rhapsodising about the “wonderfully clever lyrics” and Black Velvet simply nailing the title track as “three minutes of pop rock greatness”. Having just scooped Best New Breed at the Pure Rawk Awards, and with the feathers’n’fans video for ‘Halo’ proving especially popular, the band was poised for a leap forward. But everything was to come to an abrupt halt when, out of the blue, Jonny was diagnosed with advanced kidney failure. Tour dates were cancelled, album plans put on hold and, for the next eight months, the band retreated to playing just a handful of dates. While the gigs had a particular intensity - to a degree, every one felt like it could be the last - it was only after November, when Jonny received a kidney transplant (from his own fiancée, no less), that things could begin to move forward again. At the start of April 2013, Jonny Cola & The A-Grades returned with the David Ryder Prangley-produced Straight To Video / Marlborough Road. Released on orange 7” vinyl, with two ambitious, interlocking videos drawing influence from Querelle and The Ring as much as the reality of London musical life, the ostentatious epic of an A-side and its punkier AA have made a real splash. “The A-Grades are back to bring a blast of glam rock to your mundane lives”, said long-running zine R*E*P*E*A*T, while the likes of Mudkiss (“bursting with energy, hooks and ideas”), Music News (“a band that puts style back into music”) and God Is In The TV (“magnificent and majestic”) have been lining up to heap praise on the single. Meanwhile, in a front page feature, topped with a picture of Jonny sprawled semi-naked, coated in glitter on a gravel path, normally sober magazine The Quietus claimed, “This is glam pop at its best”. Now, with a series of gigs lined up in the capital - many of them self-promoted - alongside leading lights of the punk and rock scenes, and the second album well under way, the band are eagerly anticipating a year which is eventful for all the right reasons. In their review of the recent single, Record Collector stated, “This lot could be massive.” Jonny Cola and the boys have never doubted this. Now, finally, it seems others are starting to share this belief. Bring it on.